British author Roald Dahl’s children’s books (Matilda, The Witches, Charlie and the Chocolate Factory and others) are known for their unsentimental, macabre and often darkly comic moods. 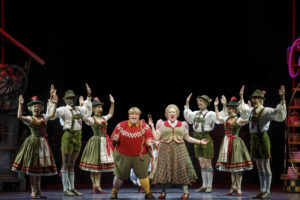 Those attributes were shown in the 2011 British created Matilda The Musical which played Broadway in 2013, picking up five Tony Awards and generating a National Tour which played the Ahmanson Theatre in 2015 and is currently being stage by 5-Star Theatricals in Thousand Oaks. 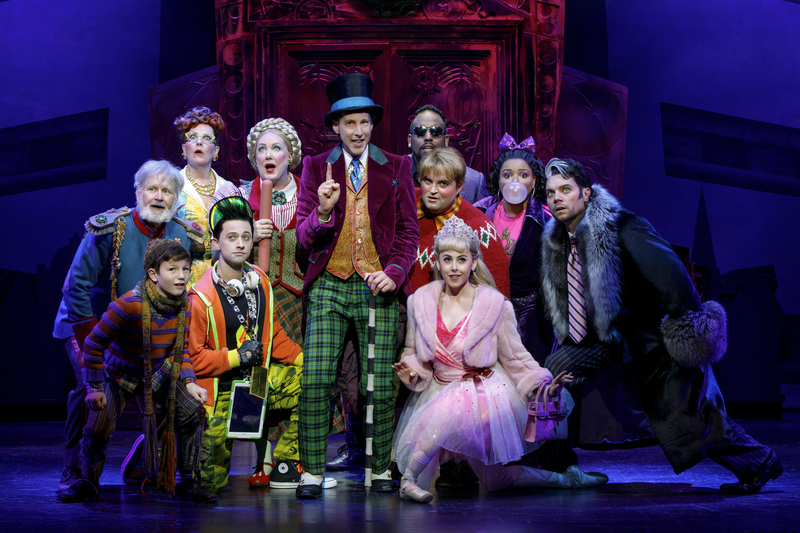 In 2013 a musical version of Charlie and the Chocolate Factory opened in London where it ran for over three years. A reworked version opened on Broadway in 2017 where it barely lasted nine months and generated no award consideration. But a National Tour was launched and is now playing the Hollywood Pantages Theatre, much to the joy of uncritical youngsters and a few childish adults. Adults who fondly remember the Gene Wilder fronted 1971 film version of the story, Willy Wonka & the Chocolate Factory, will probably be disappointed by the stage incarnation. Even devotees of Tim Burton’s 2005 remake, starring Burton regular Johnny Depp as Wonka, will probably be let down by this stage adaptation. Playwright David Grieg’s book sticks fairly close to the plotlines and characters of the novel, eschewing Burton’s addition of Wonka’s father issues. Grieg’s jokes are as tasteless as rotten cabbage, eliciting more groans than giggles, and his characters are more caricatures. Charlie’s competition for a Golden Ticket and a tour of Wonka’s candy factory are four other children from around the world. The bratty children and their enabling parents are introduced as they are announced as Golden Ticket winners. They are the porky Augustus Gloop (Matt Wood) and his bratwurst wearing Mama (Kathy Fitzgerald) from Bavaria; the balletic Veruca (Jessica Cohen) has been given a nationality change from British to Russian as well as an oligarch father (Nathaniel Hackmann); the marathon gum chewer Violet (Brynn Williams) and her father (David Samuel) are given a Southern California hip hop makeover while TV and video game fanatic Mike Teavee (Daniel Quadrino) and his stuck-in-the-Fifties mom (Madeleine Doherty) are from Iowa. The first act introduces all of them as well as quirky Wonka (Noah Weisberg) and poverty stricken Charlie Bucket (Henry Boshart, Collin Jeffrey and Rueby Wood alternate in the role) and his double job working mom (Amanda Rose) and his four grandparents who must share a bed. 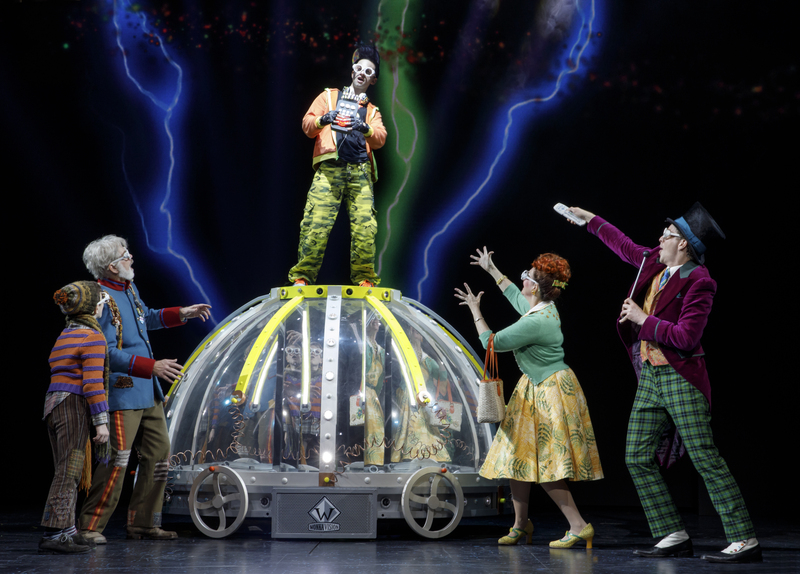 The act runs just over an hour but feels at least twice as long given the stale writing combined with the static direction of Jack O’Brien. The second act runs longer but does contain some inventive child endangerment (who knew squirrels could be so vicious to ballerinas?). The show’s most inventive and delightful moments come with the introduction of the chorus line of tap dancing Oompa Loompas. Joshua Bergasse’s choreography of these merry madcap midgets is basically the show’s sole saving grace. The 16 songs, with music by Marc Shaiman and lyrics by Shaiman and Scott Wittman are instantly forgettable, nearly forgotten as they are sung. The two standouts in the score are “The Candy Man” and “Pure Imagination,” written by Leslie Bricusse and Anthony Newley for the 1971 film. 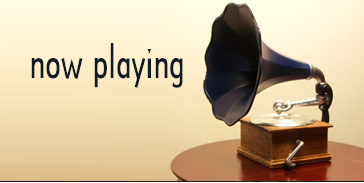 Those songs possess true staying power. 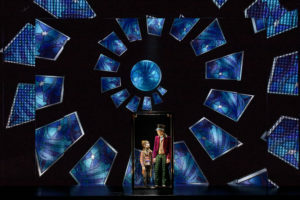 Jeff Sugg’s projection design is the show’s other highlight, but who wants to come out of a musical humming the projections.